Welcome to the first meeting of the B.B.B.F.F.B.F. "Good evening everyone. And welcome to the first meeting of the B.B.B.F.F.B.F. – the Burning Bush Best Friend Forever Benevolent Fellowship. 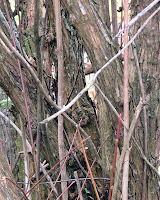 "I apologize for the cold, dark accommodations but being as we are an advocacy group for an officially declared invasive plant and therefore of necessity an underground organization we will be holding all of our gatherings in this abandoned root cellar at an undisclosed location on the once active Wilkus Farm property. 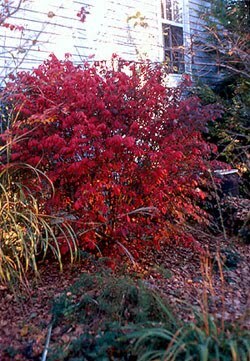 "It is especially fitting that we meet now as this is the time of year when Euonymus alatus compactus is in its glory – displaying its spectacular red fall foliage for all to see, putting to shame those other pretenders at autumnal flamboyance such as Hosta, Bloody Geranium, Ferns, Switchgrass, Blue Star and Peony. "So what is an invasive anyway? To me it is something that (a) silently sneaks into an area, (b) blends in with its surroundings, then (c) slowly and insidiously takes over. "Does BB meet those criteria? Here is what the DCNR Invasive Exotic Plant Tutorial on state.pa.us says about it. "But whose fault is this alleged infestation? Do the little BB seeds tiptoe in the dark away from their suburban homes and into the surrounding woods? I don’t think so! "Seeds do fall rather prodigiously near the base of the plant, leading to more little BB’s clustered around the mother bush. Other BB seeds are spread by birds, which are attracted to them by their nutritious, fleshy, red covering. Seeds dispersed this way germinate easily and spread rapidly. "But whose fault is this? Can the BB help it if birds of all feathers are fatally attracted? (“Don’t blame me for being beautiful.”) It’s just a simple evolutionary device for preserving the species. It’s the birds that go overboard. "B.B.B.F.F.B.F. says 'B.B.N.B.B. 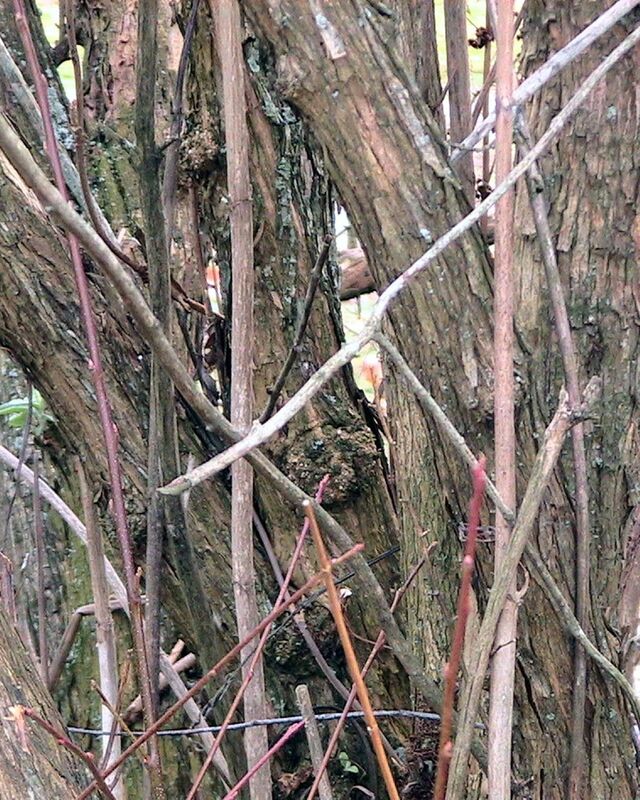 (Ban Birds Not Burning Bushes)'”. As a gardener I try to follow the advice (spoken in a thick Italian accent) of Phillip, a longtime professional and amateur horticulturalist, and former member of my garden club – "Always leave room in the bush for the birds to fly through." However, as a gardener, I also like to position my perennial plants close to each other – really close. It is the way that nature spaces things, and I do like that less-structured look. Much of the pizazz in this year’s gardens was supplied by three ornamental sweet potatoes (Ipomoea batatas) that Mars potted and placed on each side of our garage door and near the edge of our family room flowerbed. The recent pre-Halloween snowstorm decimated them and so, as part of the après storm cleanup I removed the vines from their containers. Some came out easily, one did not. I took my fork-tongued hand weeder and wedged it into the potting soil, levering up the reluctant vine. 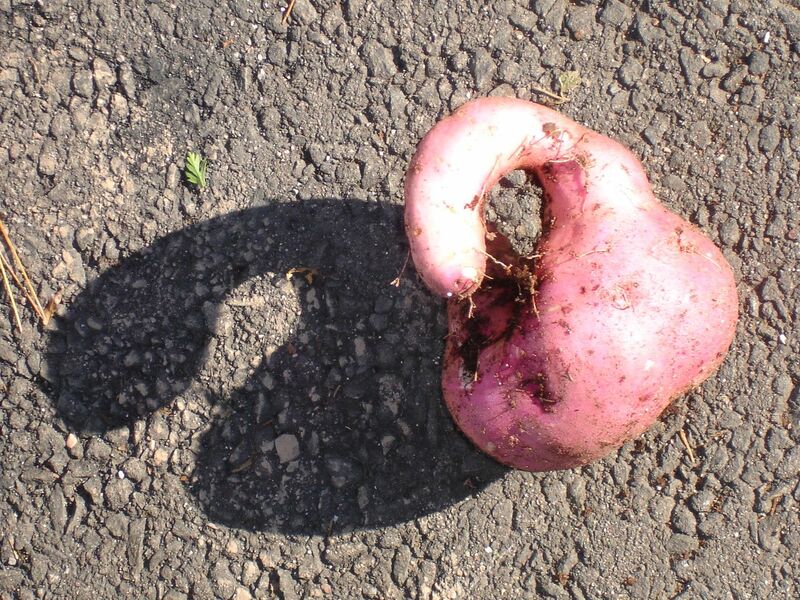 To my surprise I unearthed what looked to be a deformed sweet potato. This evidently is not stunningly unusual – at least according to the forum on gardenweb.com. The starchy tubers apparently are edible and easily propagated. Unfortunately I learned this information after I had added mine to the ugly plant portion of my compost pile – from which it is now too late to retrieve. My mind however was more attuned to the aesthetics of my discovery rather than the gastronomic. I tried to photograph it in a way that improved its appearance – while at the same time trying to figure out a way to write about the ugly vegetable. I thought perhaps something about Plato’s Allegory of the Cave wherein the shadows represent the imperfect world, and my spud (in this instance) the realm of reflected reality – except the silhouette was better looking than the real thing. Mars and I recently underwent an 8 day and 8 night electric blackout due to an unprecedented late October snowstorm. The heavy wet snow accumulated on the leaves that were still on the trees, causing branches to fall or bend down on power lines. Our magnolia took down the wire connecting our house to the power grid. We found warmth during the day at our health club and the local community center. We spent nights in our 45-50 degree bedroom hunkered down under multiple quilts in our warmup suits, socks and ski caps. On one of those mornings we were lying in bed trying postpone the inevitable return to the cold air. While trying to recall her previous night's REM sleep fantasies Mars uttered what became the middle line of the following haiku . the dreams I don't remember?